Unlike to off-grid solar systems where a purchase of solar panels (see Buying solar panels) is based on needs for electricity, grid-tied (or grid-tie) photovoltaic systems rely on monetary or in some other values (such as CO2 or total annual electricity production). This type is characterized with connecting the solar system to the local power grid, while for any kWh delivered has been established official subsidy. Therefore, these grid-tied systems are placed where power lines have already been installed and serves in order to cut household bills for electricity or to earn money by selling electricity at a subsidized price. For instance, in Canada was calculated that if 2kWp was installed in household or more (taken an average value), the produced energy from solar panels would bring the same mount of money as an average household pays electricity bills during a year. Notes this, to grid-tied PV system also large power systems – solar power plants belong to. 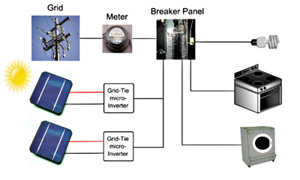 Often is confusing a difference between grid-tie and grid-connected system. In fact, speaking freely, grid-connected is a subset of the grid-tie system as a part of solar energy deliverd to household apparatuses, while in the original (in the title of the text), whole energy is distributed to the local power network. 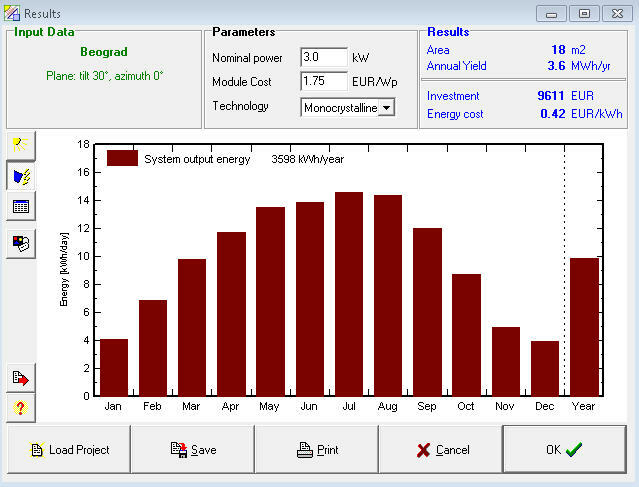 Figure 1 shows the result of the system of 3kWp installed photovoltaic system capacity and annual output of 3598 kWh, the place has no shadow! The parameters of sunshine were provided from a METEONORM. That would be about 830-1200 euros a year profit on sale of electricity (depends on peak sun-hours and subsides). In this system can be implemented all types of solar panels, and the most important thing is obtaining the largest ratio between electricity energy prices and PV modules, providing a good ROI. This means if a panel of nominal power 100Wp costs € 150 this ratio is 1.5 € / Wp (the only way is to know whether the seller is in trend with modern industry and selling prices as the retail environment). The trend is the decline in this ratio (some forecasts say at least next three years), which increases the accessibility of solar panels to citizens. The site can be viewed EcoBusiness prices and trends of price and power at retail. As noted before for autonomous net, different inverters are for off-grid and grid-connected systems. Therefore, it is important to look at specifications when purchasing and using inverters! One such example is shown in Figure 2. 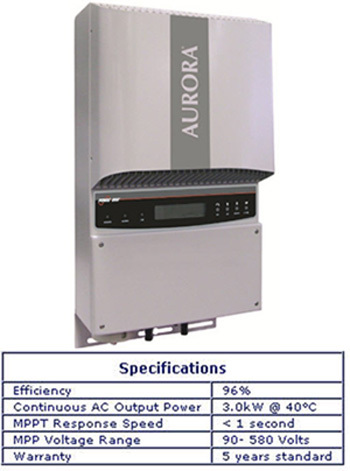 Moreover, Aurora inverters can be used in wind power plant or in other sources of DC current. With the explanations above, must be added that solar panels would work and after a 25-year period. It is guaranteed by manufacturers that after that period, their characteristics of solar cells (the basic ingredients of solar panels) will not fall below 80% of the nominal (initial) values. Second, it is very important that cables calculated for the solar purpose have a large ampacity, otherwise, current going through them can damage the panels, inverters and cause fire.